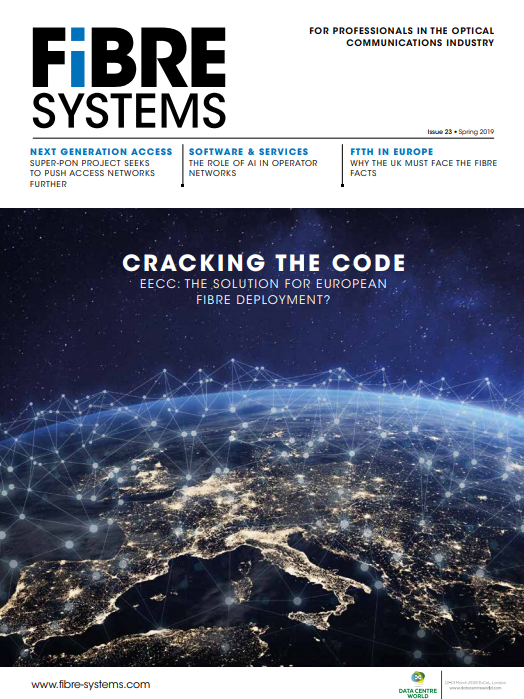 Optical systems supplier Coriant is proposing a new and potentially cost-disruptive network architecture designed to provide better cost-per-bit economics for service provider networks that are increasingly dominated by asymmetric data traffic. Dubbed Coriant Light IP, the new architecture integrates IP routing with optical transport while virtualising the higher layer network functions. Disaggregation of network functions creates opportunities for new and different ways to put the functions back together again. Coriant’s proposal ‘decomposes’ the IP router, separating Layer 3 IP forwarding from the higher layer functions. Layer 3 forwarding and optical transport are coordinated via multi-layer software-defined networking (SDN), while higher layer IP functions can be moved into the cloud using network functions virtualisation (NFV), explains Uwe Fischer, chief technology officer at Coriant. This approach would create an application ecosystem for the higher layer functions, with third-party software companies writing code for generic hardware. This could speed up innovation and expand product choice, the company says. “Nokia failed [as a mobile phone handset supplier] because it didn’t open up the application space; NFV will be the same story,” Fisher asserted. Classical telecom operators can virtualise the higher layer network functions using the very same cloud infrastructure that they are building anyway, he noted. Coriant’s vision highlights the tug of war between optical transport and IP router vendors. While optical systems houses are proposing new ways to combine IP functions with optical hardware, IP router vendors have renewed their interest in putting optical interfaces directly onto routers. In both cases, the glue that makes this possible is SDN, which provides common control of both the optical transport and IP layers. Unsurprisingly, Fischer says the big router vendors are pushing back against such a development. Router vendors differentiate their products by how they handle the higher layer functions, and would not willingly relinquish control of those functions. Furthermore, the router market typically enjoys high margins because it is dominated by a few key suppliers. Coriant’s IP-optical integration story could change all that. Fischer says that Coriant has the skills to implement this approach successfully. "Coriant is uniquely positioned to deliver this cost-disruptive, high-performance approach to network evolution,” he said. “With our deep understanding of service providers' networks, coupled with our transformational services capabilities, Coriant is ready to partner with our customers to pivot their networks into Light IP." The vision combines Coriant’s optical transport systems, IP/MPLS routing equipment and Transcend SDN solution. The major elements have already been demonstrated as a proof of concept; now it’s a question of bringing the threads of the story together, the company says.